Pinner Court (Grays Inn Road). Pinner Court was located at or near the present 52 and/or 54 Gray Inns Road / Google Earth Street View. Pinner Court was just right of the red ellipse / Edward Stanford's Library Map of London (1862-71), Bloomsbury section. 'Pinner-Court' was the late 18th and 19th century name for what is now 52 and/or 54 Grays Inn Road. There were then two short narrow cul-de-sacs there. One of them was Pinner Court, a name that may well have been inspired by the presence of the Pindar of Wakefield public house on Grays Inn Road. The street name is not found on any of the early maps I have seen, but it is included, as "Pinder's court", in a list of localities in the Compleat Compting House Companion (1763), and Lockie's Topography (1810) notes that Pinner Court is located on "Gray's-Inn-Lane,—at 35, that number on the R. from Middle-row, Holborn". Since he has Bell Court at No. 22, Portpool Lane at No. 52, and notes that Baldwin's Gardens lead to 32 Grays Inn Lane (later Gray's Inn Road), the location can be established with reasonable certainty. Anonymous. The Compleat Compting-House Companion: or, Young Merchant, or Tradesman's Sure Guide (London, 1763), p. 412 s.n. Pinder's court. Elmes, James, compil. A Topographical Dictionary of London and Its Environs (London, 1831), p. 338, s.n. Pinner-Ct.
Lockie, John, compil. Lockie's Topography of London, Giving a Concise Local Description of and Accurate Direction to Every Square, Street, Lane, Court, Dock, Wharf, Inn, Public Office, &c. in the Metropolis and its Environs (London, 1810), s.n. Pinner-Court . Lockie, John, compil. Lockie's Topography of London, Giving a Concise Local Description of, and Accurate Direction to, Every Square, Street, Lane, Court, Dock, Wharf, Inn, Public Office, &c. in the Metropolis and its Environs. Second Edition (London, 1813), s.n. Pinner-Court . 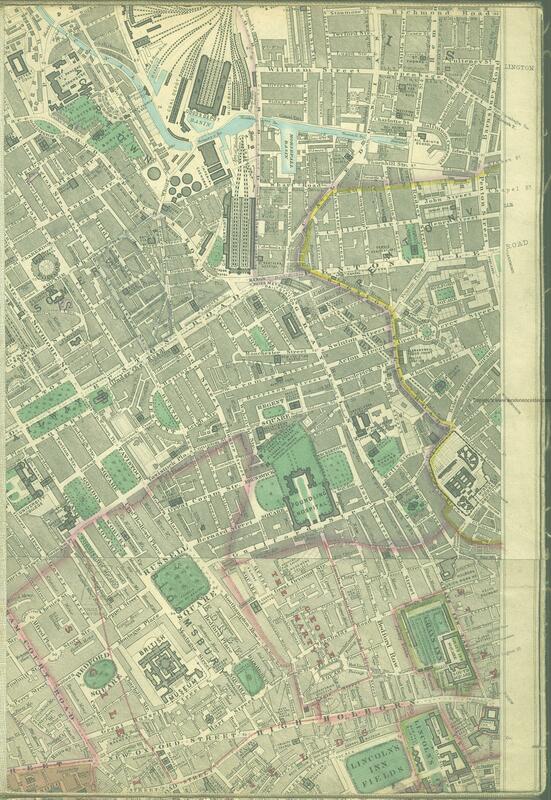 Edward Stanford's Library Map of London (1862-71), Bloomsbury section. Lockie, John, compil. Lockie's Topography of London, Giving a Concise Local Description of, and Accurate Direction to, Every Square, Street, Lane, Court, Dock, Wharf, Inn, Public Office, &c. in the Metropolis and its Environs. Second Edition (London, 1813), s.nn. Bell-Court , Portpool-lane, Baldwin's-Gardens. ↑ Anonymous. The Compleat Compting-House Companion: or, Young Merchant, or Tradesman's Sure Guide (London, 1763), p. 412 s.n. Pinder's court. ↑ Lockie, John, compil. Lockie's Topography of London, Giving a Concise Local Description of and Accurate Direction to Every Square, Street, Lane, Court, Dock, Wharf, Inn, Public Office, &c. in the Metropolis and its Environs (London, 1810), s.nn. Bell-Court , Portpool-lane, Baldwin's-Gardens.